Former Arsenal and Manchester City midfielder Patrick Vieira has been appointed as head coach of Major League Soccer club New York City. Vieira, 39, leaves his role as head coach of Manchester City's Under-21s after signing a three-year contract with New York. New York City's squad includes ex-Chelsea midfielder Frank Lampard. Andrea Pirlo, who helped Italy win the 2006 World Cup, also plays for them along with ex-Barcelona forward David Villa. Vieira, a World Cup winner in 1998 with France, will take up his new role on 1 January 2016. 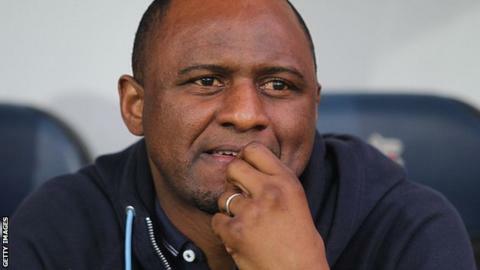 "I am delighted to take up the role of head coach of New York City FC," said Vieira. "It is an exciting prospect for any coach." New York City have just completed their inaugural season which ended in elimination from the play-offs. They averaged gates of around 29,000 at the Yankee Stadium which including 20,000 season ticket holders. Earlier this year, the New York Times reported that the club was considering a move to Columbia University's Baker Athletics Complex, at the northern tip of Manhattan. Vieira won seven major honours in nine years at Arsenal between 1996-2005. He won the Serie A title with Juventus in 2006 before helping Inter Milan to three domestic titles. Vieira joined Manchester City in January 2010 and helped the club win the FA Cup in 2011 before announcing his retirement from playing.